Infomercials have a reputation for selling bizarre products such as Rejuvenique, AromaTrim, and the good ol’ FlowBee. But there is one product current being advertised on a regular 30-second commercial during Saturday morning kids’shows that matches any infomercial gadget in its strangeness. It’s called Tooth Tunes. Tooth Tunes is a toothbrush, manufactured by toy-maker Hasbro, that is supposed to encourage kids to brush their teeth for a full two minutes by playing a song while brushing. Tooth Tunes plays the song as long as it can detect the pressure of the brush against the teeth. Huh? The target market for Tooth Tunes is probably kids 8-11. So why include this fossil rock in the mix? These songs were already getting kind of old when I was a kid. They also have a ToothTunes that plays the Theme from Rocky, “Gonna Fly Now,” which may in fact be the weirdest song choice for this product. In the TV commercial for Tooth Tunes, they feature “Rock & Roll All Night” by KISS. 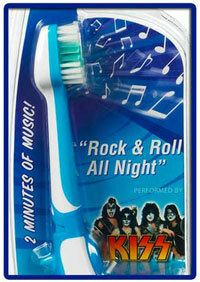 That makes a lot of marketing sense to me: I’m sure kids these days are eager to put Gene Simmons in their mouths. And here is a lame parody of the Tooth Tunes commercial on YouTube. Warning: The audio at the link above is NSFW (Not Safe for Work), which is really scary since it looks like 9-year-olds made this thing. I think this video is a good example of why TIME magazine felt compelled to name “You” as Person of the Year for 2006. I HAVE A TOOTHTUNES AND IM 10 BUT IM NOT BUYING ANOTHER ONE EVER AGIN! I GOT MINE FOR A DOLLAR AT THE 99CENT STORE AND IT WAS THE 10 BRAND! I think it would have been funny as hell if they would have used the original version of “Let’s Get It Started” instead. Wouldn’t it be simpler to just listen to the radio and brush your teeth? Its a waste to buy a radio toothbrush when you really don’t need it.